The upside of finishing the ski jacket in such a hurry was that it has freed up extra time mentally to ponder new sewing projects. 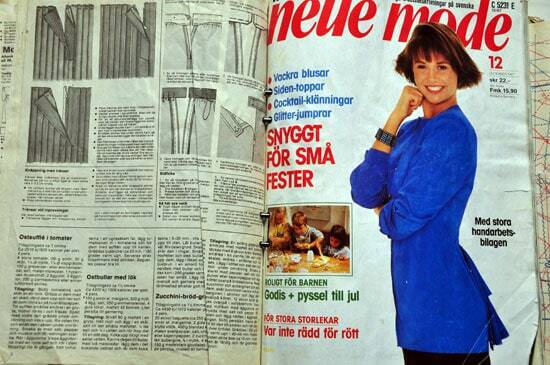 I visited the library last week and came home with a bunch of Burdastyle magazine and Allt om handarbete, which is a Danish pattern magazine. I have promised myself to be kind to myself with the next few projects and do something fun and fast. This sweater from Burdastyle February issue caught my attention immediately, because I love knit patterns that has some innovative construction. The only thing that made me hesitate was that the pattern is for tall sizes, and I’m petite! But altering a sweater is hopefully not too much hassle, perhaps folding the pattern in a few choice areas will be enough. I might do some diagonal stripes too, to make it more interesting. We’ll see! You have a very interesting blog. I really missed you while you were gone. Thank you, your comment is really heart warming! Love hearing from older readers that have found me again!